Our research group is focused on developing better biomaterials using nature as our inspiration. We are interested fundamentally in learning how cells are influenced by their environment, and then applying this knowledge to design materials for biomedical applications. Our goal is to create biocompatible and functional materials that will cure human diseases. The Liu Lab extends a warm welcome to our new postdoc, Dr. Vijay Meli. The Liu Lab congratulates Dr. Frances McWhorter, Ph.D., on her new title! We wish her the best at her new position at FDA. The Liu Lab joins Barack Obama in offering congratulations to Jessica Schlosser for earning her MS degree, and welcomes PhD student and CARE fellowship recipient Jessica Hsieh to the lab! 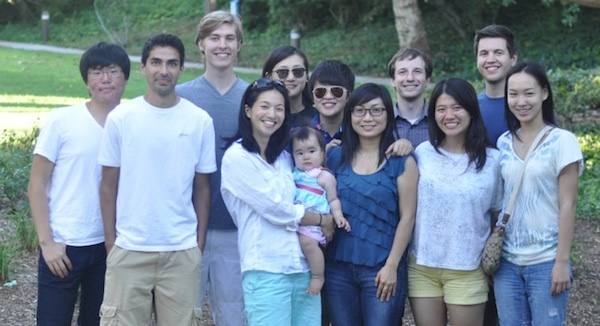 Congratulations to Thuy for receiving a CIRM-funded Stem Cell Training Grant fellowship! Look for our paper "Modulation of macrophage phenotype by cell shape" by McWhorter et al. in Proceedings of the National Academy of Sciences of the USA, online before print.